Dr. Temperance Brennan, Quebec’s director of forensic anthropology, now returns in a thrilling new investigation into the secrets of the dead. In the bitter cold of a Montreal winter, Tempe Brennan is digging for a corpse buried more than a century ago. Although Tempe thrives on such enigmas from the past, it’s a chain of contemporary deaths and disappearances that has seized her attention — and she alone is ideally placed to make a chilling connection among the seemingly unrelated events. At the crime scene, at the morgue, and in the lab, Tempe probes a mystery that sweeps from a deadly Quebec fire to startling discoveries in the Carolinas, and culminates in Montreal with a terrifying showdown — a nerve-shattering test of both her forensic expertise and her skills for survival. 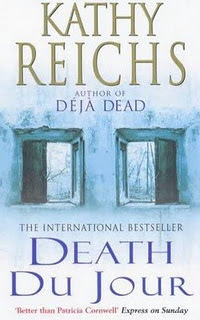 Death Du Jour is the second book in the Temperance Brennan series and the first one I’ve read. Brennan, who has inspired the character of the same name in the Bones Tv show, is a forensic anthropologist who occasionally helps the police to solve murders. I’m usually not a big fan of thrillers and detective stories really, but throw in a bit of history and I’m hooked. The book starts with Brennan digging up the bones of a nun, Elizabeth, that’s been dead for more than a century and has now been proposed for sainthood. But as soon as she sees the bones, Brennan realizes that there is something wrong with them. And so she starts doing some research on Elizabeth and the times she lived in to find out the true story the bones seem to tell. This to me was the most interesting part of the book (especially when it describes the history of Montreal), but it’s a small one. Because while she’s working on the nun’s bones, she’s needed to help solve another case. There’s been an arson fire in St Jovite and several bodies, including those of two newborn babies, were found in the house. The police is trying to find out who these people were and how the fire originated. As the story progresses, more corpses are found and as that wasn’t enough, one of the nuns calls Brennan because she needs to find her missing niece (seriously, Brennan can’t go anywhere without something bad happening) . And Brennan’s sister Harry arrives in town to attend some course that’s supposed to teach her out to take control of her life but is actually getting involved in a cult. All these things seem unrelated but Brennan is in the position to find the link that connects them. Reichs is very good at dropping hints and so at times the reader can see some connections when Brennan can’t, but still the end was a surprise. There were a few things I didn’t see coming at all. The book is a very fast-paced read, full of twists, turns and subplots but it is still very easy to follow. The book is also full of forensic and anthropological details and the procedures she and the police use to solve cases are minutely explained (I felt like I was watching an episode of CSI at times really). There is also a plethora of information on cults and what prompts people to get involved with them. However, this is done in a simple manner that’s easy to understand and leaves the reader interested instead than just bored, even though that makes the book longer than it would otherwise need to be and Death Du Jour, what with all is happening in the story, is a very long book indeed. Long, but highly enjoyable. Death Du Jour by Kathy Reichs is a fast paced thriller full of twists, turns and surprises that you won’t be able to put down. The protagonist, Brennan is working on a series of murder cases that seem all unrelated to one another while also dealing with her sister Harry who’s getting herself involved in a cult and doing research on the life of a nun that’s been dead for more than a century. The book also includes a lot of details about cults and forensic procedures, which are told in a very straightforward, easy-to-understand manner that, although they make the book longer, enhance the story.